Nerd Nighter Nate Owens posted an interesting question on his blog this morning: "Could I reduce my collection to just 10 games?" I think it's a fascinating exercise, and it's tangentially related to Jones Theory, which states that we should keep only the best game in each genre/style in our library, so as to play only the best games. I'm occasionally asked what my favorite games are, and the answer is quick for me: "Betrayal at House on the Hill and Battlestar Galactica". These are numbers 1A and 1B, but I don't play them often because they require a specific type of play group (great friends!) and a specific atmosphere (relatively quiet, a place where folks can pay attention for 2-3 hours). When I started to answer the "ten games" question, I assumed I'd list both of these, but I surprised myself by omitting one. The "rules" are that each game can have as many expansions as necessary included, and they all count as one item on the list. For my sanity, I'm not including my Magic: The Gathering cube as a game, as it occupies a different place in my gaming life and frankly, I'm writing the article so I get to cheat a little bit. Betrayal is my favorite board game. It's best with the maximum number of players (a rarity in hobby games) and is one of the few games I've ever played that I don't care about winning. In fact, I'd go so far as to say that if you're playing Betrayal to win, you're doing it wrong. I LOVE the stories and inside jokes that come from Betrayal. I LOVE the Mystic Elevator. I LOVE Ox Bellows, the strongest, dumbest guy on the block. There are so many elements of this game that I reference in discussions of other games, so many little stories and situations I share with my friends, that it almost feels like a great TV show that we've all watched together. My love for Betrayal is almost entirely based on the human interaction it engenders, and the stories we tell together. I suppose it's like an RPG in that way - it's about the people, not the game. I've had folks tell me that it's no different from dozens of other games that create the same response, but I think it's unique. I love the "choose your own adventure" feel of the haunts and how they're assigned, and I'm a sucker for stories in games that I'm not allowed to read until I unlock them during play. Everything about Betrayal is amazing. It's a 9.8/10, the highest ranking I've given to a game I own or have played. I've only played Race a few times, but it's enough for me to know that Donny Behne, frequent contributor to this blog and a great friend of mine, considers Race to be his favorite game of all time. That opinion is seconded by Nate Hough and Jason Hammer, two other core Nerd Nighters that help shape my taste in games. I deeply enjoy the flexibility of using cards as currency, and I love that there are multiple paths to victory in each game, and that these can be pursued mostly evenly by all players. I don't know the expansions well enough to comment on them, but I can say that I've enjoyed each game of Race for the Galaxy that I've played, and it's among the best card games in my collection. That, along with the consideration of my friends, is enough to keep it in my top ten. I love bidding, and I love bluffing. I love those two things. I also love using victory points as currency. Medici does all three of these things, though the bluffing is non-traditional... I'm trying to convince the other players that I want a thing more or less than I do, so as to impact their bids. I've reviewed Medici here, so I'll let you click for my full analysis. It's a really, really fun game for 3-6 players that gives me EXACTLY what I want when I open the box. 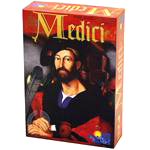 Thanks to Marcelo for the tip two years ago - Medici is a beloved title in my collection and will always be there. It's one of the very few games that I feel comfortable recommending sight-unseen to other gamers. Lords isn't the "best" worker placement game I've ever played, but it's the most compelling. As you'd expect from a Wizards of the Coast/Dungeons and Dragons product, everything about the game is beautiful, and the production quality is top-notch. Thanks to John from Knyte Technologies I've got epic custom meeples that match the theme of the game. It's a visceral delight to set Lords up on the table, and I've enjoyed every game of it I've ever played. I was asked why I find the game to be so compelling, and it's difficult to explain. Though the lore and flavor are neat, they're completely unnecessary to the mechanics of the game. It's cube-pushing, really, with some light set collection. Even so, the quality of the components, the art, and the flavor text work together to produce an immersive gaming experience. Also, the quality of each game is not particularly variable. That is to say, this game is well-designed to provide intrigue and tension each time it's played. Being "good" at Lords of Waterdeep requires attention to detail, managing multiple avenues to completing quests in case opponents take away your primary paths to scoring points. All in all, it's just a great game that I've played almost 200 times. There are other games in the genre that other folks adore (like Puerto Rico), but Lords is my favorite. To the best of my knowledge, it will always be on my shelf. Included: Scoundrels of Skullport expansion, though I prefer the base game by itself. Chosen instead of No Thanks to be the light card game in my pool. Coup is a great hidden-role game that is also best with more players, so this gives me four legitimate options to play with a group of 5-6 players (Betrayal, Medici, Coup, 7 Wonders), each of which provides a different experience. I'll have a full review posted shortly, but for now just accept that Coup is best-of-breed when it comes to light, quick, social/bluffing games. It's a blast, and a must-own for every collection. What can be said about Ticket to Ride that hasn't already been said? It's one of my top-two "gateway" games (along with Lords of Waterdeep) and is a pillar of my collection. I've played TTR over 750 times (counting solo iPad games vs the AI) and still really enjoy the game. It's just as good for 2-3 players as it is for 4-5, and in my experience creates the kind of tension that turns game players into lifelong gamers. I said as much in my previous review - Ticket to Ride is for everyone, and for me. I was introduced to Summoner Wars by Nate Hough, one of my best friends and one of the original members of DFW Nerd Night. 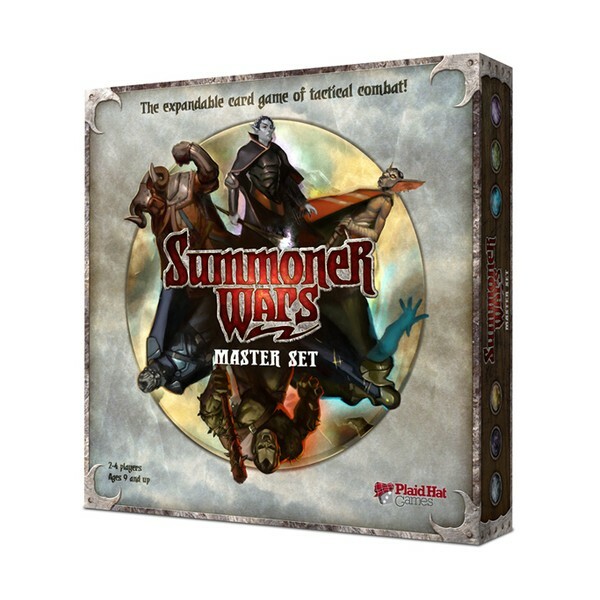 I've played hundreds of games of Summoner Wars on the iPad, and dozens in person. I still love the game and the tactical puzzles it presents. I'm a huge fan of the various play styles that are enabled by the factions. I ebb and flow in my SW love, as I'll sometimes go months without playing, then get in 10 games in a week. It's always there in the background as a game I adore and will happily play at a moment's notice. Drafting is another of my favorite mechanics, and I'm an absolute sucker for card games. 7 Wonders is panned by some as being "two games" - one of playing cards, and one of counting points at the end. I don't mind the counting, and I love the progression across the ages of establishing a resource base, then building better and better structures and wonders. 7 Wonders provides a LOT of interesting choices during the game, like knowing when to take a resource card that I'll need later instead of a building that I need now, or what to bury to build my Wonder stages. I've played it hundreds of times and I still really enjoy it. It's also a great game for newish players to the genre, as it pushes players to make choices in an environment of incomplete information, and rewards players later in the game for careful planning. It's easy to learn, but worth playing multiple times in an evening, and that's just great for me. I reviewed 7 Wonders here earlier this year, and I feel just as strongly today. 9) Disc Duelers, by D. Brad Talton, Jr.
Every collection needs a dexterity game! Sometimes you just want to flick wooden disks around a table, and I don't own a Crokinole table. Disc Duelers is a "designer's game", in that the box is full of components with a light rules set, and explicitly encourages players to make their own variants and game types. I've already played soccer, hockey, capture the flag, and king of the hill variants, and I'm working on designing a 4' x 4' MOBA-style table to simulate League of Legends with these little wooden discs. I'm really a huge fan of this game (full disclosure, I work for Level 99 Games), and I play it often. I once had the chance to walk through the entire BoardGameGeek library and pick a single game to play, and I ended up pulling out their copy of Disc Duelers and playing it on a spinning wooden tabletop with two levels. It was awesome! 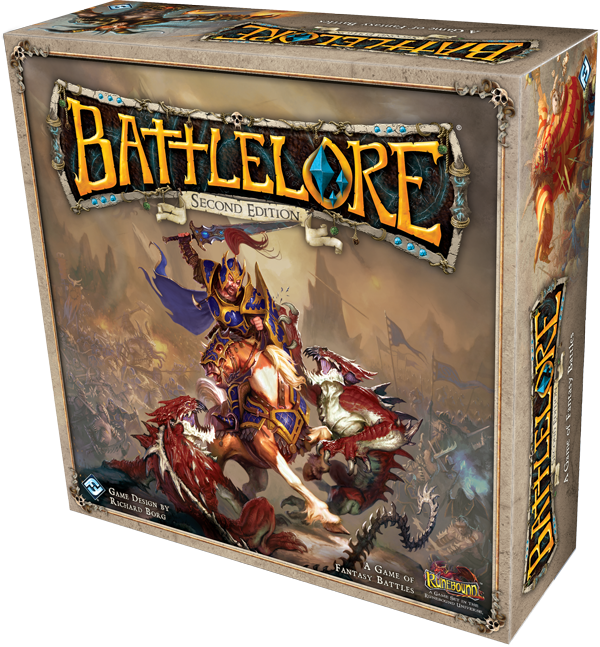 I've never played BattleLore and I don't own the game. I cheated, alright? I put this as number ten and hoped you wouldn't notice because it's at the bottom of the list. I've been in a once-a-week Memoir '44 campaign with Eric for a few months now, and I love the game. I really enjoy the Command & Colors system of issuing orders, and I just love the modular terrain and the mix of strategy and tactics required in each mission. I read Donny's review of BattleLore and watched the Shut Up and Sit Down video and I'm in love with the theme. I'm already a fan of Terrinoth because of Rune Age, and the production quality is exactly what you'd expect from a Fantasy Flight release. Combined with the C&C system and a beautiful board... I'm hooked and I haven't even played the game. It's the thing I want most in my collection, and I love Memoir '44 too much to not have a C&C game on my list. What's your top ten? Leave a post in the comments! Honorable Mentions: Battlestar Galactica, Love Letter, Manila, Carcassonne, Small World, A Game of Thrones (2nd Edition), Noir, No Thanks, Domaine, Dragon Valley, The Resistance.